Matthew, Mark, Luke and John did not write the Gospel says biblical historian Gary Greenberg in his latest book, Who Wrote the Gospels? 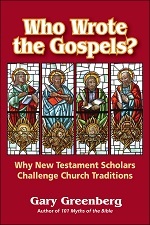 Why New Testament Scholars Challenge Church Traditions. At least, not the Matthew, Mark, Luke or John of Church tradition, he adds. Controversial as this view is, he notes that it is widely accepted among New Testament scholars. Yet few members of the lay public know about this modern scholarly consensus, let alone why scholars hold these views. Not only is there a question of the identity of the authors of the original Gospel texts, the evidence from ancient sources also shows that during the first few centuries of Christianity many Christian scribes deliberately altered the Gospel texts and many of these changes have been erroneously incorporated into our modern Gospel accounts. In one notorious example, the last twelve verses of Mark, the first of the four Gospels to have been written, depict the resurrection of Jesus, but they were not part of Mark’s original Gospel. The verses were added later by an unidentified scribe trying to bring Mark into line with the other Evangelists. The famous story of the adulterous woman in the Gospel of John is also a late addition to the Gospel, absent from all the earliest sources. One scribe placed the story into the Gospel of Luke. In his book, Greenberg guides us through the complicated and little-understood world of Gospel source and text criticism. He provides easy-to-follow explanations of the scholarly arguments and provides numerous examples to illustrate the reasoning process leading to the conclusions adopted by the scholarly community. ● What is the Synoptic Problem and how do scholars resolve it? ● What is the mysterious Q source that influenced Matthew and Luke? ● Is there a literary relationship between the Gospels of Mark and John? ● Did the original Gospel of Mark depict the resurrection of Jesus? ● Did the Evangelists agree with each other about important story details? ● Why did orthodox Christian scribes alter the Gospel texts? ● When scholars encounter significant contradictions in ancient Gospel manuscripts, how do they decide which text comes closest to the original? ● What manuscripts stand behind our modern Gospel texts and how accurate are they?